About "Forgotten God (Unabridged 3 Cds)"
Francis Chan (born 1967) is the former founding pastor and teaching pastor of Cornerstone Community Church in Simi Valley, California. After being raised by his Buddhist grandmother in Hong Kong, Francis came to America at the age of five. His mother, stepmother and father all tragically died before his 13th birthday. Francis came to know the Lord in high school and in 1994 he and his wife Lisa started Cornerstone Community Church in Simi Valley. From just 30 original attendees, Cornerstone grew to 1,600 members by 2000. Francis stepped down from his role at Cornerstone in 2010 - by which time the church had 4,000 regular attendees. He believed God was calling him and his wife to take a 'step of faith' to launch a new ministry as an extension of Cornerstone Church, in a large city in America. Since 2011, Chan has concentrated his church planting efforts on San Francisco, where he has been involved in Abundant Life Christian Fellowship, a multiethnic, non-denominational evangelical church. At Cornerstone Francis started up diverse and influential ministries including Cornerstone Television and Eternity Bible College (from 2004). He has been a highly sought-after speaker at many Christian colleges and youth conferences in the US and internationally. His commitment is to teach directly from the Bible and his passion is to see the next generation of American Christians display a much deeper love for Jesus. Francis is committed to radical gospel-centred generosity in relation to his own finances. He gives away the majority of his income to charities, including the royalties from sales of his books and training resources. He is on the board of directors for Children's Hunger Fund and World Impact. Francis has used astute investments in restaurants and real estate to finance his own mission outreach efforts. Francis is the best-selling author of several books, teaching DVDs and study guides. His book Crazy Love: Overwhelmed by a Relentless God has topped a million sales since its release in 2009, and all the proceeds are donated to charity. With an authentic message, a radical call to true faith and a dare to fall head over heels in love with God, Crazy Love's challenge has resonated in hearts of all ages. Francis and his wife Lisa, have seven children, and live in San Francisco. Mike and Danae Yankoski live in the Pacific Northwest with their dog, Elliott. Their passions include backpacking, hiking, running, tea, growing veggies, good books, and substantive conversation. Mike is the author of Under the Overpass and Danae is the co-author with Francis Chan of Crazy Love and The Forgotten God. Recently they have written together Zealous Love: A Practical Guide to Social Justice. 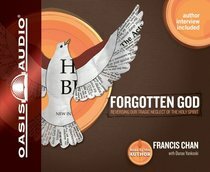 Customer Reviews For "Forgotten God (Unabridged 3 Cds)"
It is true that the Holy Spirit is often the forgotten God, or potentially the misunderstood God, and this book does a fantastic job of changing that for the reader. I have always found Francis Chan to be very black and white in his thoughts and writing, and I found the benefit of this to be paramount in this book. For a topic where there seems to often be a lot of grey, Chan's solid doctrine and practical gospel-centered application make this book a must-read for any Christian who questions 'Who is the Holy Spirit?' and 'What role does He play in my life?' or simply wants to grow in their knowledge and relationship with God. I thoroughly enjoyed the book and the way Chan presented all different aspects of the Holy Spirit. All answers and explanations are backed by scripture. This book truly encouraged me to seek out the Holy Spirit and expectantly wait on Him. Francis Chan is a man who lives what he preaches. He has stepped back and looked at his life in the Western church and how that lines up with the Bible. Forgotten God gives the reader an insight into the doctrine of the Holy Spirit according to Scripture. It challenges those of us in Western Churches who try and "fabricate" or change who the Holy Spirit is. You will be challenged, inspired, and encouraged by this book. I like Francis Chan's books in the way that he challenges people to move out of their comfort zone. We need these kind of books as we tend to be complacent in our Christian lives sometimes. This book is a good introduction on The Doctrine of Holy Spirit. Our church uses this book for teaching this doctrine. Not only is this book good for The Doctrine of Holy Spirit 101, but also good for our spiritual growth, because as the title says, we have been neglecting the Holy Spirit. Chan invites us to reflect on why we need the Holy Spirit, and he also draws examples from the book of Acts how the church should look like when we are filled by the Holy Spirit. I love how he writes that if you were in a desert island with only the Bible, then you go to today's church, you'll be shocked that how we have drifted so much from the first Congregation in the book of Acts. Overall, this is a great book, and I highly recommend it.